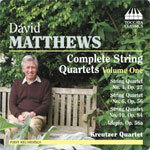 David Matthews’s innate musical craftsmanship shines through these three string quartets, comprising the first volume of Toccata Classics’ survey of Matthews’s output in this medium (eleven such works at the time of the disc’s publication, September 2010). It’s a welcome look at a body of music deserving a wide circulation; intricate but accessible music. The opening raptures of the Fourth Quartet possibly look back to Frank Bridge’s music and is indicative of how Matthews (born 1943, in Walthamstow, London) embraces the past - not least the Viennese classics as well as Sibelius and Mahler - a composer who holds dear the formality and the history of the symphony and the string quartet. The Fourth of Matthews’s string quartets (from 1981) is a large-scale, 30-minute affair, lyrical, mischievous and deeply felt - the slow third movement particularly eloquent - and crowned by the finale, the longest movement (at 13 minutes), a recitative-led allegro (with slower contrasts) that returns to earlier material via some intensely argued, even acerbic music (sometimes reminiscent of Shostakovich) and also determined by what one might term as ‘urgent optimism’ if leading to what this listener hears as the uneasy peace and ambiguity of the final bars. David Matthews’s Fourth Quartet is a ‘big’ work in every way, and is gratefully followed by his short Adagio, which was written in memory of art-critic and writer Peter Fuller who died in 1990 in a car accident; it’s a subdued and touching elegy that is also to be found, extended, as the central slow movement of String Quartet No.6 (1991) and which itself feeds thematic ideas to the outer movements, respectively rhapsodic and energetically positive. String Quartet No.10 (2001) is the shortest of the Quartets recorded here, its 12 minutes comprising two movements, one slow (quite sad and naturalistic), one fast (athletic and with dew-infused lyricism, rather Tippettian at times), a song-and-dance piece (the former courtesy of an Australian magpie called Munroe). It’s a rather special work, immediately appealing and endearingly throwaway at the close; and also haunting and inviting many return visits. These are all first recordings, and were made with the composer in attendance. If the sound is a bit dry and edgy during fortissimos, then the musicians are faithfully captured in lower dynamics. In any case the opportunity to get to know this music is paramount, as is the anticipation of future volumes in this very welcome series.